Many pilots dream of flying far, but the reality is that we rarely get the weather to cooperate to try it here on our little island. Once in a while everything comes together and gives us an opportunity to push the boundaries of distance flying here. Sunday was our day, where everything seemed to come together for a moment. First, a bit of history: Josh Cohn flew 35 miles from Makapuu to Pipeline on what would be described as an okay flying day a few years ago. But few of us are Josh. Maybe Doug Hoffman is closest in ability. Funny thing is Doug is here on Oahu visiting family, and on his last day, he joined us flying a borrowed glider. Also flying were Alex, Jorge, Scrappy, Shawn, SD Tom, Jim, Stalker, Tim, Jon, RD, and others who I fail to remember at the moment. Cloudbase was high, close to 4,000 feet, and the wind was light and east, actually southeast for those who care. These conditions are some of my favorites for flying far from Makapuu, because while the early miles are a bit cross, our island wraps more to the east as we head north, essentially making things easier the further we go. Most people were launching a cross Tomato Juice launch with a few bombouts in the light air. The loose plan was to fly together, but I was high and Jorge was going already. Easy climbs on the east faces were the order of the day. My Oudie was reporting wind directions from 80 to 130 degrees all day, a direction that doesn't seem like it would work, but the proof is in the pudding and conditions were stellar. Hikers everywhere, no airspace restrictions in Kaneohe, beautiful views of our little island shrinking below our feet: the east wind was making the miles fly by. By the time we reached Waihee, Jorge and I were getting hoovered into the clouds. Over the radio I might have used the word "ganked" to describe our situation. Alex later reported that that description unnerved him, and after that he worked hard to avoid getting "ganked" into a cloud. We both instinctively flew towards the ocean and away from the mountain in the cloud. While I had planned on an easy cruise through BoogaBooga Land, we found ourselves out front and high, with Jorge well on his way towards the front of Kualoa. At Kualoa, we hooked into a nice thermal to get high over Kaaawa Valley with a glide straight to Punaluu. After a bit of helicopter dodging, we dug in for a bit to gain some altitude. Amazingly, the wind flow was out of the valley, but up. Up is good. We took a fairly deep line and caught another nice thermal somewhere in the hills above Pounders. I went on a long glide towards the windmills and Jorge went higher and deeper. 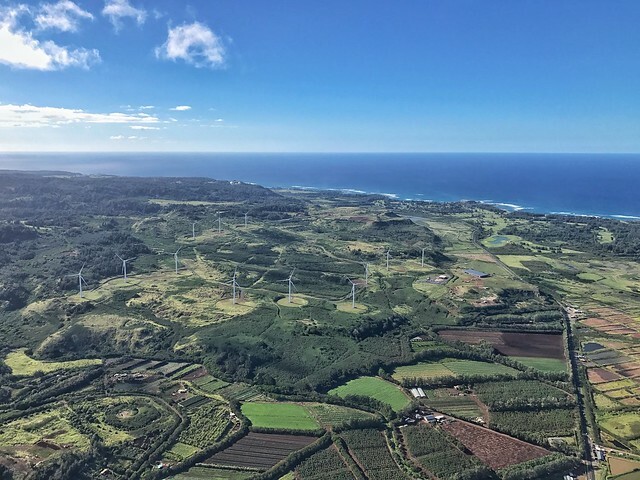 I was cruising above Kamehameha Highway in the strengthening wind, perusing a place to land, when I happened upon that rocky rodeo lump next to the windmills. Bang, I was into some strong ridge type lift coming off that rock face. At 100 feet over, I parked straight into the southeast wind and climbed. It seemed strange to be climbing like this, parked above a little knob by the road. Noticing how strong the wind was getting and realizing that I didn't want to be high and possibly blown past Turtle Bay and out into the ocean, I headed off to a cattle pasture across from Turtle Bay Golf Course to land. At this time I assumed Jorge was somewhere behind me, but he was actually 3,500 feet above on the mountain. He reported peeking down the North Shore toward Waimea, and while I would say the distance record was likely his (Josh reported being 2,200 feet here), he didn't have the stomach for the wild leeside ride that was ahead. He pushed speedbar back upwind to land next to me. Doug reported that he had landed "IN" Waiawa Correctional Center in Waipio, and already had his ride home. What the...? Duck did the dirty deed and passed on flying to drive out and pick us up. Meanwhile Alex and Scrappy floated into sight. Alex came in high and fought his way down through turbulent windmill rotor to land near us, with Scrappy landing at the Kahuku Golf Course. The problem was Alex landed just a bit further downwind than we had, and apparently there were slaughtered and rotting cattle carcasses all around at that spot. Other then offended olfactory nerves and a greasy smear on his harness, all was fine. Shawn by this time had landed by Ching's store in Punaluu, for his longest flight to date. He has really been charging and we expect to see a lot more from him in the future. Back to Doug. He had been flying with Alex and Scrappy by the Pyramid, but then he backtracked and climbed to 5,500 feet (likely in a cloud) and dove over the back of the Koolaus towards Mililani. Another bit of history: he had done this before, years earlier, on a different borrowed glider. That time he managed to climb out over Mililani and begin a climb up the Waianae Mountains, before sinking out at Kunia. I am sure the ultimate plan is to reach Kaena Point for the 44 mile all time record. The hang gliders have attempted this before, with the most recent being Leo Buchanan going over the back at BoogaBooga Land and having to land in the "Dinosaur Cage" up at Whitmore Village. Yesterday, Doug reported finding no workable lift in the southeast flow, and he landed in Waiawa Correctional Facility, the only clear landing around. He said it all went well and he was escorted out. His son picked him up and he was on his way. After Duck picked up everyone, we met up with Thom "Sidelined" Therrien at Kahana for the rest of our retrieve run. I love a good retrieve: drinks, stories and lots of laughs. I have to take my hat off to the drivers who don't get to fly but have to listen to all the flying stories about what an awesome day was had. They are the true heroes of this story. At least that is what we keep telling them. As Doug told me years ago, you don't really need other pilots, just drivers. Five of us had our longest flights on Oahu, on a rare stellar day. I know a few other guys missed the train from Makapuu and these stories hurt them the most. Next time! Thanks for the story Dave! For me the day was much more mellow - a bomb out and re-attack which went much better. I haven't been out much in 2016 but listening to you guys on the radio was awesome and I think might have even re-kindled my stoke. Thanks! Awesome, inspiring flying - next time I'm gonna chase. Thanks for the super write-up, Dave. And bomber run! "I" was one of those on the wrong train. Weather reports were calling for S/E winds and vog. The girls wanted to take the boat out to swim with whales. What's a guy gonna do when you have 4 hotties in teenie bikinis wanting to go boating? One problem, is the boat decided it didn't want to go boating. Two batteries smoked and one starter we headed home. First HEY REAPER one of those hotties was my daughter!!! Ok, now for the important stuff. Great write up Dave! An inked briefing for us that are molting and flightless eases the pain and anguish of being grounded. Ya, listening to you guys recap the flight is the next best thing. Congrats to Scrappy whose actually showing up and going places these days, maybe he's back. Congrats to Shawn, you have been charging, well deserved long flight. The memory of that will have to get you through the shoulder surgery. Jorge, Dave & Alex........whatever, you guys should be doing that down and back again. Kidding....great flight....I am just salty. Thanks for the entertaining story, Dave! It's funny how the train split into two groups, the testosterone trio charging ahead right into the clouds, with the more tentative trio mincing our way carefully down the range, staying well below that solid grey sheet of suction overhead. You ended up flying the length of the windward side in two and a half hours at the speedy pace you guys set! I landed a leisurely hour later, glad to find you guys still down there folding up. We've flown that mission many times before but this was surely one of the easiest days to do it, even without the help of our fluffy friends overhead. The start was bit disconcerting but it quickly turned into a perfect easy downrange mission, an obvious day to try and eke out our personal bests for straight distance. I sort of feel like I can check that one off now and focus on other missions. Like, what Doug did. Ha ha, just kidding. Actually I have fantasized about trying a line over the Poamoho trail if the opportunity ever presents itself. You know, a light thermic day with cloudbase at 5 grand, sparse clouds formed into nice convergence streets straight from Boogaland to Kaena Point. Anyway, I can dream. Thanks again for leading the charge and for your excellent recap of the day.